WILLEMSTAD — “If one really would proceed to develop from Lagun Blanku up to Punt Kanon in such a way, this reef will certainly be affected or die back within 4.5 years. This is a fact”, said Rolf Bak, an worldwide renowned authority in the area of coral reef research. He speaks in response to the recently organized public hearing by the Government to inform the public on the plans regarding Oostpunt and the possible zoning change of the terrain. The presented zoning plan for Oostpunt includes among other things the possibility of tourist development along the coast of the aforementioned area with five resorts/hotels with marinas, surrounded by residential areas along the lagoons. The possibility to further open the lagoons and make them accessible for boats was also mentioned during the presentation. The possible effects on the exceptionally valuable coral reefs in the same area were left out of the plans presented. Professor Dr. Rolf Bak, associated with the University of Amsterdam (UvA) and the Royal Dutch Institute for Sea Research (NIOZ) and editor-in-chief of the scientific journal Coral Reefs of The International Society for Reef Studies (ISRS) has the longest running monitoring system/research worldwide on the condition of corals. This research began in 1973 on Curaçao and Bonaire, among others, and gives a clear picture of the change in average coral cover on these islands, including those at Oostpunt. Through the years, a general decrease in coral cover is observed. “When I began the research in 1973, average coral cover for the entire island was between 35 and 45 percent. This value decreased considerably over the years and is now 15 percent, with the exception of Oostpunt where an increase in coral cover has been observed over the past twenty years. 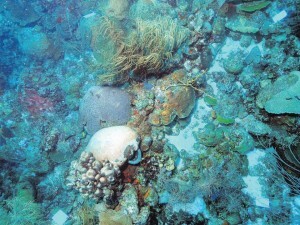 The reefs of Oostpunt are special because they still have an average coral cover of approximately 45 percent”, said Bak. He emphasized that the condition of corals within the Caribbean area is generally poor, but that Curaçao is still in a position to preserve these unique ecosystems for the future. “Curaçao has only few resources. Nowadays a healthy coral reef should be considered a ‘commodity’. One could sell it – with that I mean tourism – and make money. 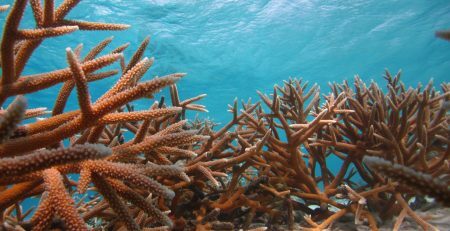 A cautious calculation points out that a well kept reef yields 1.6 million dollars per linear kilometer per year. These yields will only increase considering the increasing scarcity of healthy reefs elsewhere in the Caribbean and the world (for example the Red Sea). The reefs of Oostpunt, in their current condition, will only become more valuable. One can really see it as a ‘golden egg’ for the future”, said Bak. He states that the possible developments, as presented recently, will irrevocably lead to the degradation of oostpunt’s reefs within a relatively short period of time. Bak confirms that Oostpunt’s reefs supply the downstream reefs along Curacao’s entire southwestern coast with juvenile fish and corals as recently stated by the American marine biologist Aaron Hartmann. Bak continues: “When the lagoons are “opened” (i.e., dredged), this would have a disastrous effect on the reef. The sand/sediment from the lagoons would quickly cover the reef causing it to die. You can easily imagine what the effect would be of the actual construction of houses and hotels …”, said Bak. As a possible compromise between developing and not developing he mentions the possibility of developing some areas along the coast downstream, i.e., to the west of Hamrack (towards Fuik). An example of the longterm changes on Curacaoan reefs. In this figure the average coral cover at 4 depths is shown for sites on Curacao other than Oostpunt. 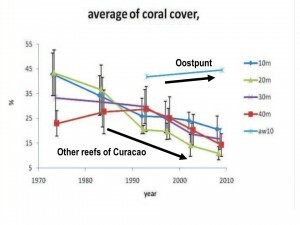 The light blue line shows the change in coral cover at Oostpunt, which is, in contrast to the rest of the island (and most places in the Caribbean for that matter) increasing.